Thanks for sharing your memories of Jean Giraud, Steed. In all of the reminiscences I’ve read since his death, including your own (and Li-An’s, which I decoded via Google Translate), Giraud always shines through as a thoroughly decent, hardworking guy. 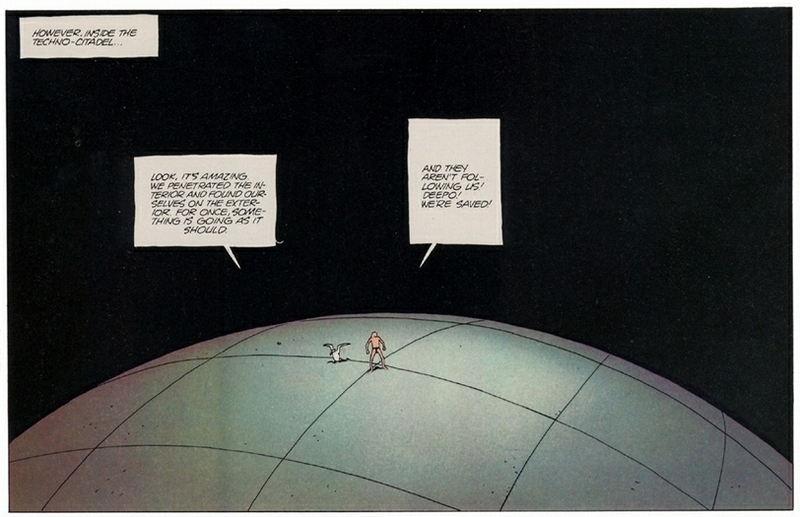 “Many people have asked us during these past years why Humanoids hasn’t released the incredible works that Moebius created alone (without Jodorowsky) during his tenure at Metal Hurlant, and that are widely considered not only his best, but some of the most interesting work ever done in the European comics scene. @Rippke Jean-Giraud had some sort of falling out with the Lofficiers; perhaps there is some legal (or personal) reason that translations can’t (or won’t) be done without both of them. More information at http://web.archive.org/web/20071026095613/http://… . 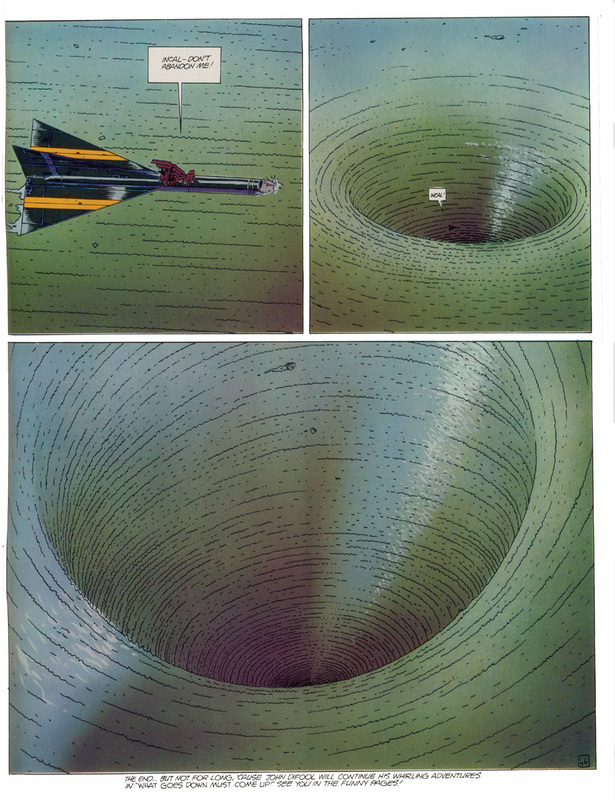 Perhaps more information is available in “Starwatcher Stalemate : Lawsuits between Moebius and Lofficier Span Two Continents” / by Michael Dean. p. 14-15 in The Comics Journal, no. 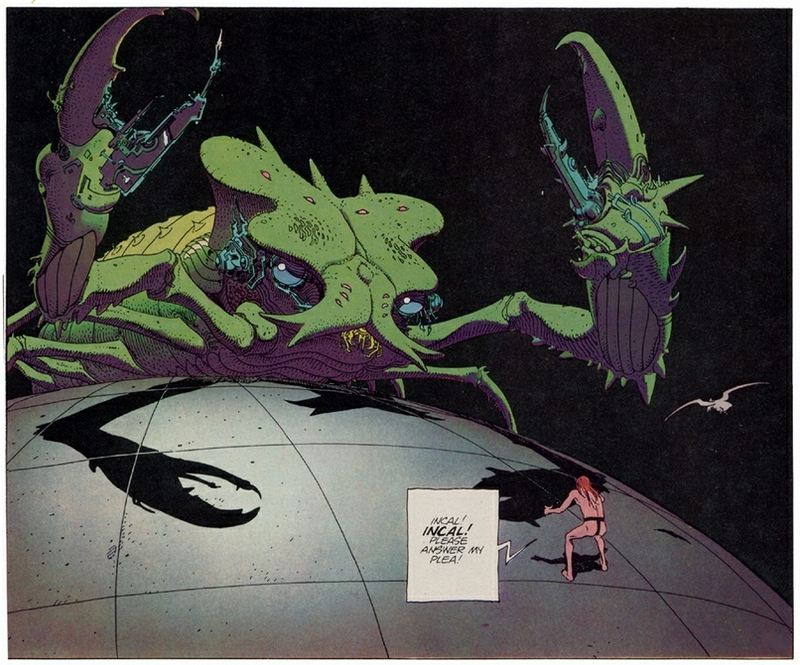 233 (May 2001) or “Starwatcher Wars : Moebius and Jean-Marc Lofficier Struggle over Worldwide Rights” / Michael Dean. p. 19-20 in The Comics Journal, no. 231 (Mar. 2001). I have recently told by someone who works at a comic book store that the legal issues have been settled and that more translations are forthcoming, but I don’t know if that is true or not. M., the great artist, has been latched-onto by a notoriously wretched parasite (known all over France under a horrible nickname) whom he web some 15 years ago – she gradually began to tare away at ALL his business relations, as is frequently the case in bad clichés involving a younger bride, and that included the partners of his whom you mention, but many more. Because the parasite is incompetent, she did not exactly go into battle with savvy, and this has led her and her artist husband into some rather ridiculous, pathetic and often self-defeating lawsuits (including one against Luc Besson for plagiarism on the 5th Element, years after M. had signed and agreed to work on the same film). Also because she is uneducated, paranoid, and “manages” everything on her own, it is nearly impossible for anyone to deal with her (on this side of the pond, and all the more in France, where people are much more aware of the situation) – and THAT more than anything is why you are not likely to see any more reprints or translations of his work outside of France. No one in her circle is currently mentally able to negotiate anything in the English language, or in the ‘reasonable’ language…There is a lot of narrow-minded thinking at play, all told, and regrettably for the beloved master, he suffers and waffles through it all, sheepishly, until the bitter end. Or to quote him about it, “I know, I inspire only pity!” That’s the gist of it. I might close by saying that although I must sound biased in my description, I have no personal stake in any of this. I do not know any of these people personally… But should you visit any comic book store or setting related to the graphic art world in France, you will be amazed to see the unanimity you encounter, albeit perhaps less informed, regarding this terrible, terrible situation which is so ‘textbook’ it should be taught in school. Art School! He is a superb artist, but he is known to be utterly self-defeating in countless ways. 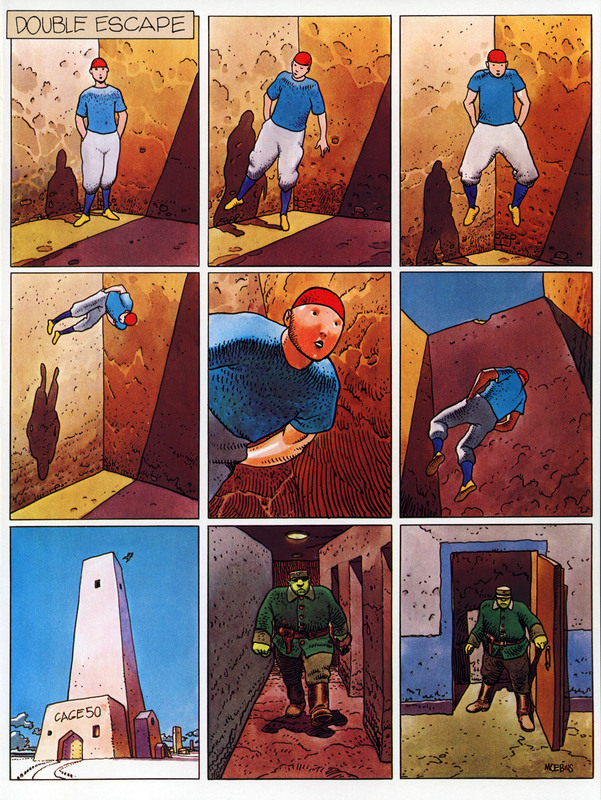 Keep in mind, Moebius didn’t die in poverty. He lived in comfort. He did only the work that he really wanted to do. He had long been able sell his originals for very large sums of money. He controlled how and where much of his work was presented in print, because he himself controlled many of the copyrights. He travelled the world, and was fêted wherever he went. And so on. Alejandro Jodorowsky has a couple of interesting things to say in the documentary Moebius Redux: A Life in Pictures (2007). You know illustrators’ wives are very, very miserly. Illustrators’ wives discuss the contract terms… the percentages, this and that. Because the illustrator is like a child. He spends hours drawing, he’s still in his childhood. So he needs a mother to protect him and who makes things work. 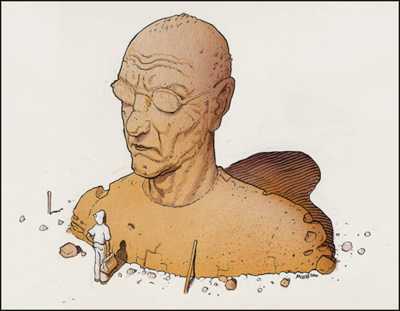 There is Jean Giraud, the artist and Jean Giraud, the human being. They are two things. 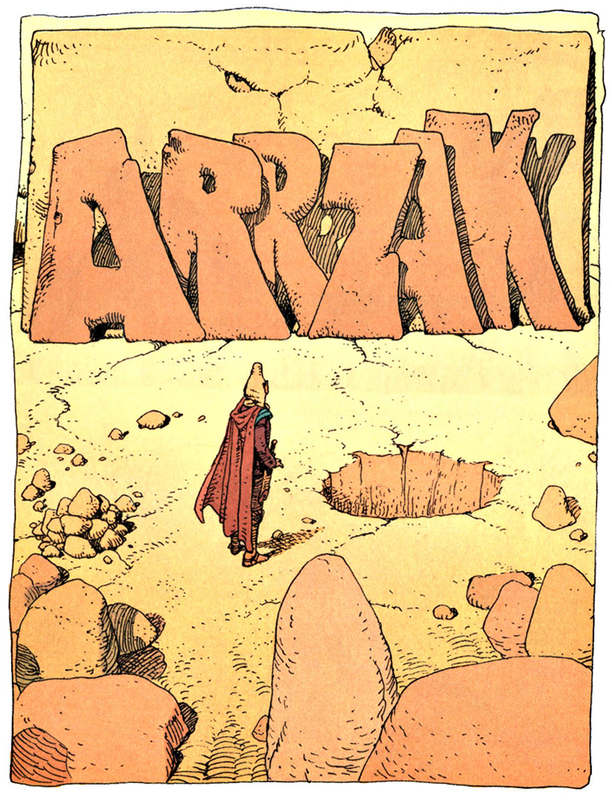 As a human being, I would be wary of Jean Giraud… because you just can’t grasp him. You never know who he is. I know him as an artist. As a human being, I don’t know who he is. I’ve known him for years now and I don’t know who he is. Everything that you do pleases me; even your name pleases me. In my film Casanova, I called the old doctor-herbalist homeopathic half-magician half-sorer “Moebius.” It was my way of showing you my affection and gratitude, because you are so wonderful. I have never had the time to tell you how much or why. I hope I can convey that to you now. I am in the middle of filming* and as usual I am suspended in a feverish frenzy — perhaps this time even a bit more feverish than usual. I have a distinct feeling that I have yet to begin filming, yet at other times I feel as though I finished a long time ago. I live as if I am suspended weightlessly in one of your oblique universes. I am sorry that this letter is a bit hasty and might tend to ramble on, especially because the joy and enthusiasm that your drawings exude demand of me great precision. Yet I find myself telling you of my happiness all at once. What a great film director you would make! Have you ever thought about it? What is most astonishing about your work is the lighting technique you use — especially in your black-and-white drawings. There is a wonderful, phosphoric, limelight, lux perpetua, solar-rimmed light effect to your art. To make a science-fiction film is an old dream of mine. I have thought about it for many years now, way before the present vogue of these films. Undoubtedly, you would be the perfect collaborator; however, I would never call upon you because you are too complete, your visionary strength is too formidable. What would there be left for me to do? 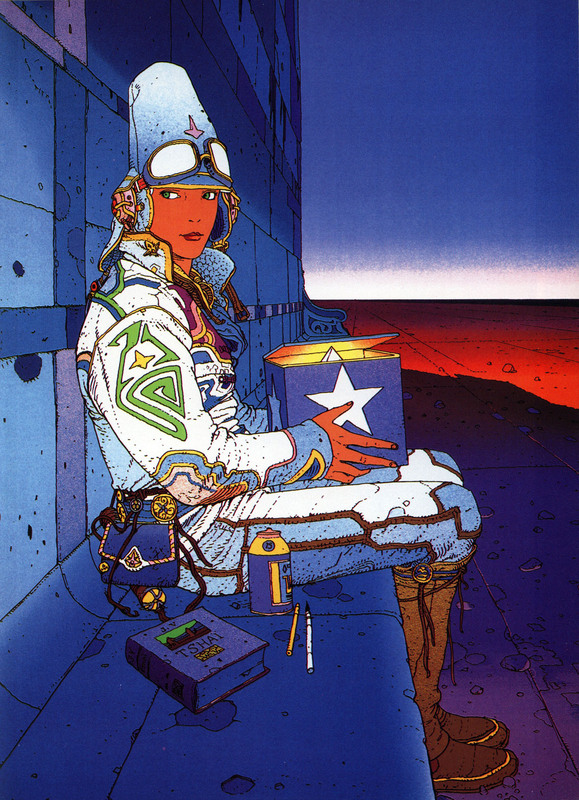 That’s why, dear Moebius. I say to you: continue to draw fabulously, for the joy of us all. *Editor’s note: Fellini was forking on City of Women at the time this letter was written. Well, I’ve been adding to and fiddling with RCN’s Moebius memorial link list (see above) for almost a week now, and I think it’s finally time to put the thing to bed. I’m a tiny bit disappointed nobody has remarked on that opening sequence of four images; both in terms of the progression of colour and the content, I thought it was pretty cool. Anyway, I do hope somebody out there finds the list useful. Also hope that the links don’t expire too quickly. That’s always annoying. Any e-mail adress that I could send you a nice document to ? I’m curious to see what arrives. Message received, Steed. Obviously, that’s a very impressive collection of signatures, but I have to say, I think that having Kubert and Gir/Moebius — two comics giants who also happen to be two of my own favourites — right next to each other is especially terrific. On youtube, somebody or other has posted footage of Kubert, Moebius, and Neil Adams drawing together on the program Tac au tac. 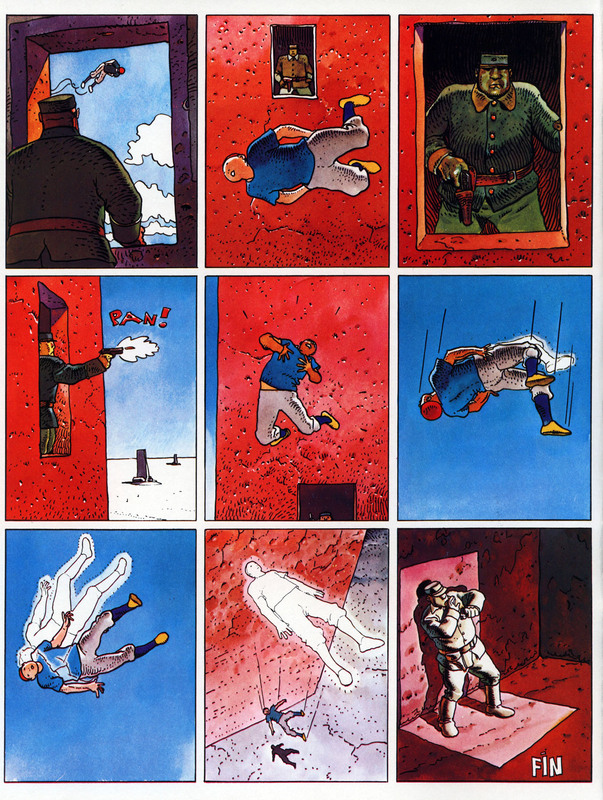 See Giraud (Moebius), Kubert & Adams – Tac au tac (30-9-1972) (colour) or Giraud (Moebius), Kubert & Adams – Tac au tac (21-10-1972) (black and white). How young they all look! I also love the drawing of the leering coyote on the first sheet. Not sure who the artist is — Albert Chartier? — but it’s exactly the sort of “inscription” that one hopes to get when one asks for a cartoonist’s signature! A few scans would be very cool, Steed. Here’s the cover and a sample that I found online. I’d love to see more!